Internships are essential today. They’re the best way to gain experience, develop a professional network, and get your foot in the door – which is why so many interns are willing to work for free. The small Group of lucky young professionals who find internships that pays more than many full-time positions. Glassdoor.com, a jobs and career community where people share information and opinions about their workplaces, compiled a list of the 25 highest paying internships, based on at least 20 intern salary reports for each company. 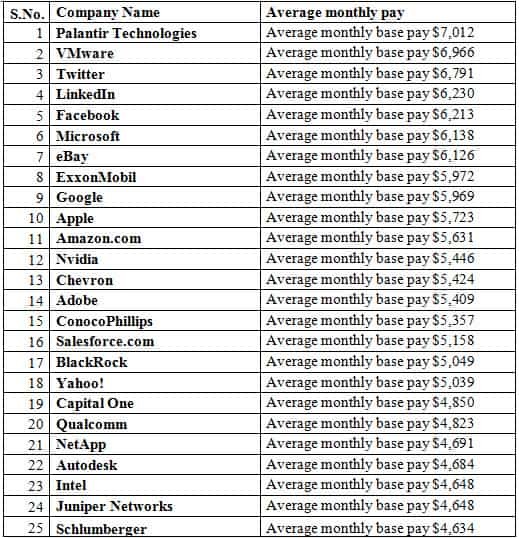 Palantir Technologies landed the top spot with an average monthly base salary of $7,012, out-ranking tech giants like Facebook, Microsoft, Google, and Apple.